This watercolour was one of a group done at the Summer School in Moriah, New York, in August 1929. 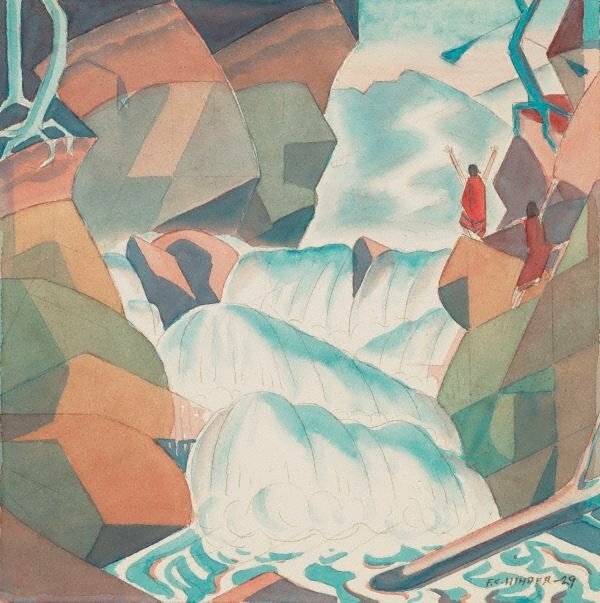 Frank Hinder was influenced by the work of Nicholas Roerich, founder of the Roerich Institute, where Hinder was then studying. Roerich (1874-1947) was a Russian painter, theatre designer, scientist, archaeologist and philosopher, who worked in Russia until 1916, as well as in Finland, the USA, India and Central Asia. His works are intense in colour and pantheistic in vision. Signed and dated l.r. corner, pencil "F.C. Hinder - 29".